“You mind your words.” Richa shouted on the top of her voice. The debate competition had turned into a heated argument between two people, each trying to satisfy their own ego. An influencing topic like corruption had been out of the league and each of them was blaming for the other’s mind to be corrupt. Richa had been the champion of her school debate team but Raj’s swift talk drove her mad. Even he was not ready to behave or think logically. The debate had to end with both of them being asked to leave the stage. Ever since, they hated each other. A glance of the other on the streets of college would turn the fire in other’s mind. They competed in each and every event the other was taking part into. Their hatred could not become as famous as when they were spotted being together. Their rivalry grew and they realized that they need each other even more. The event of them walking on the sidewalks, holding each other’s hand spread like a forest fire in the campus. Richa was a happy-go-lucky girl. She was arrogant, rude but good from heart. She had big dreams and worked hard for it. Raj on the other hand was a calm and introvert person. He found happiness in small things. Their love story had been quite dramatic till now. Different people used to quote different movies which resembled them. It was not just them but their love story which had been a part of people’s talk. Richa felt good to hear it and wished to let it remain like that forever. They had been dating for sometime but Raj hadn’t proposed her yet. It wasn't that he didn’t want to but because she wouldn’t let him do it. She wanted him to propose her in a way to make it memorable. She would often google ideas and ask him to propose her that way. Raj would often let it go off with a laugh and sometimes get into planning the events with her. 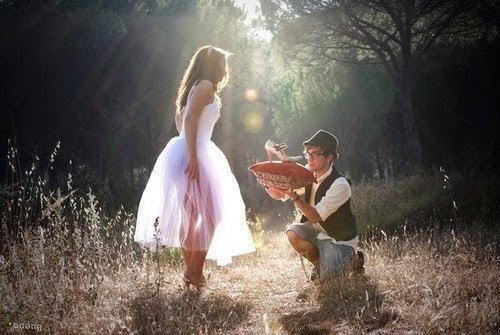 She had clearly stated that either he has to make the proposal a cherished one or be ready to take a NO as the answer. This would irritate Raj the most. One night, they were chatting as usual. They would chat till 4am usually but today the clock had stroked 5 and he was still not ready to hang-up. He suddenly asked her to meet and go for a stroll. It was still dark outside and they were walking all alone. He was holding her hands tighter than usual and he was not paying attention towards her this time. “Wait.” He moved a little far from her. There was complete silence. The sun has just risen and she could hear the movement of the sun going up. A ray just touched her and she could feel the warmth. She looked up and the reddish sky with golden shades was nothing like what she had seen before. As if a painter had just poured down the colours and let them find their own path. It was even better than her imaginations. Just then a huge flock of birds passed over chirping the most beautiful song ever. The cool breeze made her wish to fly along with those birds. She was mesmerized by the beauty so she took few minutes to look down. She stayed there, calm and speechless. There he was right in the front. Bent on the knees holding a single rose in his hand. He looked at her and said the magical three words. A sweat tickled down the ear of Raj. He didn’t know what she would say now. She ran and hugged him. It was perfect.